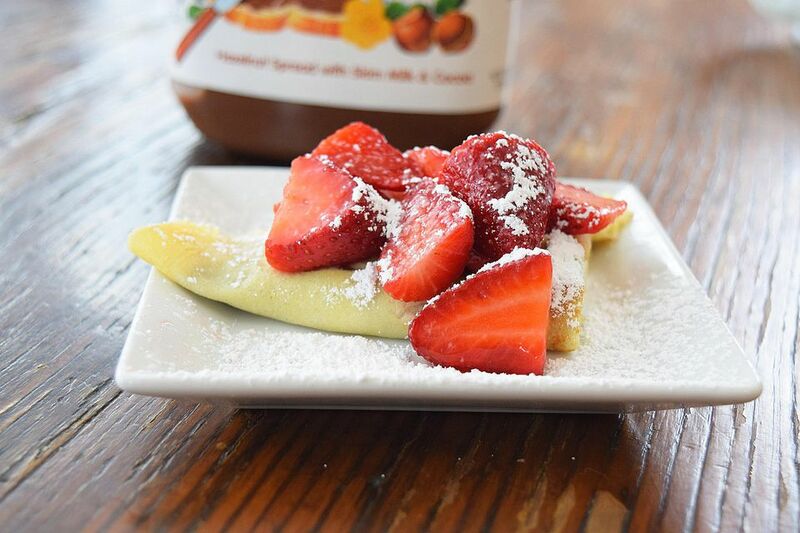 MMM...nothing beats a thin, delicate, buttery crepe, especially when it is filled with Nutella and topped with strawberries! These french beauties are the perfect breakfast or brunch treat! Serve them alongside a buffet of waffles, pancakes, and cinnamon rolls and you will have a happy group of people! Think crepes are intimidating?? Think again! You can easily make them at home with just a few tricks to help you out! The first trick being to let the crepe batter sit for a little while in the fridge. This lets any bubbles have a chance to rest. Too many bubbles will cause your crepes to tear! It's also important to have some kind of non-stick pan or cast iron griddle. You can make them in a stainless steel pan too; if you have enough butter. Butter always makes it better! I have been dying for one of those electric crepe griddles. Those make flawless crepes, but they are expensive and a trusty old pan will do! Mix together the melted butter, eggs, water, milk, flour, and sugar in a blender. Blend and pulse for about a minute. Make sure it is completely mixed. You can scrape down the sides of the blender if you need to. Cover the blender and let the mixture settle for at least 10 minutes and up to a few hours in the fridge. Heat a non-stick or cast iron pan on medium high and coat with butter. Make sure the heat is not too high, so the butter will not burn or get too brown. Pour about a 1/8 cup of the batter onto the pan and swirl the pan to spread the batter. It should be a very thin layer of batter. Cook for about 30 seconds. Then flip. Use some kind of flat wooden or silicone spatula to flip the crepes. They are very thin and delicate. Let the crepe cook for another 10 seconds or so. The crepe should be a nice light yellow with a few brown spots and marks. Remove from heat and repeat until batter is finished. Spread Nutella over the crepe and fold into fourths. Serve with strawberries or bananas. Top with some sifted powdered sugar! Crepes are best served immediately after cooking. In my experience they do not store well and are not very good left over. This crepe recipe can be used for making other types of sweet and savory crepes, too! Try them out with eggs, ham, and gruyere or with lemon and powdered sugar! If you are making them savory, simply leave out most of the sugar! Do Hot Dogs Have Real Ingredients or Mystery Meat?